Arnold Schwarzenegger spoke at the Terminate Gerrymandering Rally in East Lansing on Saturday. Arnold Schwarzenegger visited East Lansing Saturday morning to say ‘hasta la vista’ to gerrymandering. 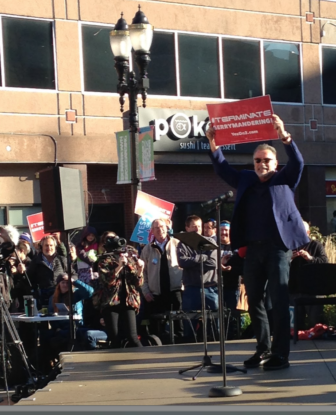 The former Republican governor of California and actor known for the Terminator franchise made an appearance at the Terminate Gerrymandering rally held by Voters Not Politicians. The nonpartisan group is responsible for putting Proposal 2 on the Nov. 6 ballot. If passed, the proposal will end the partisan redistricting process known as gerrymandering. Gerrymandering is a process by which members of a state’s house of representatives redraw voting districts in a way that secures seats for them and their party. Districts are redrawn every 10 years to reflect changes in population. With no laws against gerrymandering, parties in power have been able to create districts that favor one party above another. In this way, Schwarzenegger said, politicians are choosing their voters instead of voters choosing their politicians. If passed, Proposal 2 would implement anti-gerrymandering measures in Michigan, such as using a commission of 13 citizen volunteers representing both parties and independents, rather than legislators, to redraw district lines. Getting Proposal 2 on the ballot in Michigan began with the launch of Voters Not Politicians in early 2017. The group collected more than 425,000 signatures to get the proposal on the ballot, Ahead of redistricting scheduled for 2020. Volunteer Amy Ralston helped gather signatures. Of all the ballot items she will vote on Nov. 6, she said, Proposal 2 is among the most important, tied with the races for United States Senate and House of Representatives. “This will provide a way for the people of Michigan to take control back of the voting process,” she said. Proposal 2 was challenged in court by the group Citizens Protecting Michigan’s Constitution. Graham Crabtree argued before the Michigan Court of Appeals and Michigan Supreme Court on behalf of Voters Not Politicians in Citizens Protecting Michigan’s Constitution v. Secretary of State. He said Citizens Protecting Michigan’s Constitution had challenged ballot proposals before and challenged this one on the grounds that it altered the state constitution too much to be decided by a ballot proposal and that the petition did not make clear the extent to which it would alter the constitution. Corri Byres, who helped organize the Terminate Gerrymandering Rally, agrees. She said redistricting reform is often thought of as a leftist issue, but “It crosses all boundary lines, from Democrats to Republicans. That’s why the Terminator is coming out today.” She said the support of a prominent Republican shows voters it is a non-partisan movement and draws attention to the proposal. The Michigan Secretaru of State’s Office has postd the full ballot language of Proposal 2 and a sample ballot. Chloe Peter is a junior in Michigan State University's Honors College pursuing double majors in Journalism and Political Science and a minor in Religious Studies. She spent her summer as a reporting intern at HOMTV and plans to continue her career in public affairs broadcast and eventually work as a political correspondent at NPR. In her free time, Chloe enjoys hiking, cooking, and watching Masterpiece Classic.